KOBLENZ, Germany -- Shot twice at the bloody denouement of Ukraine’s revolution, Yuri Marchuk spends his days in the most pristine of hospital wards, gazing out the window at this orderly German city, churning images of battle through his mind. Mr. Marchuk, 36, a self-described nationalist and small-businessman, is among several dozen Ukrainians sent to four countries in Europe to recover, physically and mentally, from their wounds. Their memories bring stark life to the drier language of a report last week by the acting government in Kiev that blamed former President Viktor F. Yanukovych, his riot police and their suspected Russian assistants for the violence that killed more than 100 people in Kiev in February. Those who survived could prove to be important witnesses to the events of Feb. 18-21, days in which, Mr. Marchuk said, the protesters almost lost control of their Independence Square, the Maidan, before pushing back riot police despite deadly fusillades from unseen snipers. That bloodshed prompted three European foreign ministers to broker an agreement between the protesters and Mr. Yanukovych, who fled some hours later as his government crumbled around him. Mr. Marchuk and others who were wounded are being treated in five hospitals in Germany, as well as in Poland, the Czech Republic and Slovakia, and say that they are chafing at being out of action. They are left hoping against hope that the blood spilled to oust Mr. Yanukovych will, after 23 years of rocky independence and flagrant corruption, finally usher in a new era in Ukraine. “Some people on Maidan were irritated by corruption, some by bribery, some by police injustice, some by absolutely buyable judges,” Mr. Marchuk said. “For some, it was hard to accept that they live from pension to pension while others sit on gold toilet seats. “But for all the people on Maidan, there was a uniting factor,” he added. Dmitri Herasimenko, 28, an electrician who worked near the Maidan in Kiev and went each day to the square after work, now nurses serious internal and shoulder wounds that his doctors in Prague say will keep him off work for a year. “My only hope is that we elect the right people to government this time,” he said in an interview last week. While foreign reports on the unrest in Kiev often depicted peaceful scenes of tens of thousands waving European flags, some of those hurt said it was always clear to them that violence would be needed for real change. Vitaly Samoylenko, 37, from Irpin, just outside Kiev, took part in the peaceful 2004 Orange Revolution, which ultimately brought little relief from Ukraine’s chronic problems. “I knew this time we would need force and that there would be blood if we wanted to break free,” he said in Prague, a day before he was released and returned to Ukraine. He was treated for triple gunshot wounds to his arms and chest sustained on the Maidan on Feb. 18. The Berkut riot police advanced on the protesters, who set fire to their own barricades, he said, in a desperate effort to confuse their attackers. At night, he said, the Berkut had been like “blind cats,” lashing out because they could not see their exact targets. In daylight, he said, “it was really, really scary” because the Berkut could overwhelm the protesters. Carefully skirting questions about the arrival of guns stolen from a government depot in the western Ukraine city of Lviv, he said the Maidan was saved because hundreds of new volunteers from three cities in western Ukraine got around roadblocks and arrived by bus. At the time, organizers in Lviv said they alone were sending 600 people a day to Kiev. That enabled exhausted defenders to eat and sleep while new arrivals built barricades and then, early on Feb. 20, thrust toward the Berkut positions. Mr. Marchuk, who said he was from Khmelnitsky and the leader of a sotin, or hundred — an organizational formation used by protesters — followed around 8:30 a.m. He was shot in his right leg, and said he lost much blood but continued on Institutska Street, the main scene of carnage that Thursday. Only when he took a second hit, from a bullet that seared through his left leg, did he crawl under a shield, he said. Others carried him to the makeshift medical center at the nearby Hotel Ukraina, then to another first aid post, where he was taken to a hospital. “Later, I understood that many people died because they did not get medical assistance in time,” he said. Against a doctor’s advice, Mr. Marchuk said he discharged himself after getting a splint on his left leg and bandages on his right. He went back to City Hall, he said, checking on the fate of the 35 members of his hundred who had volunteered for that Thursday. Two were killed, 12 wounded, the rest all right, he found. Two days later, he said, friends sent an ambulance that took him to a hospital in Khmelnitsky. His father, Nikolai, had been a surgeon in the town, but it was not clear if that connection played a role in Mr. Marchuk’s being transported to Germany. 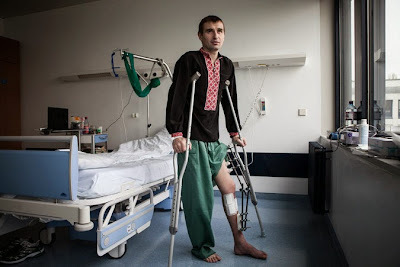 Volunteers, either Ukrainian or with Maidan connections, helped select and arrange the transport of the wounded in Europe. Ivo Dokoupil, of the charity People in Need, in Prague, said he traveled to Kiev several times during the protests. After the Feb. 18-20 violence, he said, he and his colleagues took care of about 150 people, many in private apartments because they were frightened of arrest — or worse — in state hospitals. “Police would barge in and drag people out of medical facilities,” Mr. Dokoupil said, citing witnesses. He said he and others selected 38 of the wounded to come to the Czech Republic. Most had been hurt in Kiev, but three came from Khmelnitsky, where a Feb. 19 demonstration turned violent, killing two bystanders and wounding several people. Mr. Dokoupil said he was still getting word of patients needing treatment, some even from as far east as Kharkiv, Ukraine’s second-largest city. In Koblenz, Mr. Marchuk said he will need at least one operation to graft bone from the back of his body to his knee. A volunteer from Cologne visited him and brought postcards of its splendors, and strawberries. All that matters to Mr. Marchuk — a man who said he had fought official corruption and harassment since 1998 and has long been close to Oleg Tyagnibok, leader of the nationalist Svoboda party — is getting back to the action, he said. In these revolutionary times, he suggested, it is not enough simply to be a patriot. You have to defend what you treasure. “To sit in the kitchen and simply cry about how much we love Ukraine, that is a crime,” he said. While thankful to Germany for his treatment in one of the country’s best hospitals, the army facility in Koblenz, he says he is disgusted by what he sees as German acquiescence and puny sanctions in the face of Russia’s annexation of Crimea. “Germans are used to living by exact rules,” he said, gesturing to the ward, the town and the neat vineyards etched for centuries into the Rhine and Mosel Valleys here.